We are consistent in offering to our clients a premium quality range of Mobile Scaffold Tower. We have developed this range using best quality raw material. Customers are availed this range in the most comprehensive and industry leading prices. We have stringently checked this range as per the standards. Mobile Scaffold Tower with Stabilizers offered comprise precision construction based scaffold towers with stabilizers. These are made available by us in scaffolding width of 1.45 m and in scaffolding lengths of 1.80 m, 2.50 m and 3.00 m. Further, we can make these available in working heights that can be extended from 4.50 m to max. 13.45 m with standard part support. These have loading capacity of 200 kg/m2 which depends on platform size that can be made available from 270 kg to maximum 810 kg. 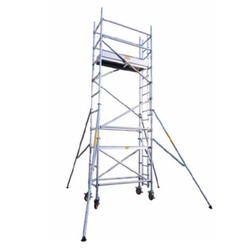 Looking for Mobile Scaffold Tower ?